Computer modelling in new study estimates that 57 per cent of U.S. children who were between two and 19 in 2016 would be obese by their 35th birthday. Nearly three in five children in the U.S. today are destined to be obese when they reach their 35th birthday, according to a new projection published in The New England Journal of Medicine. Computer modelling, using current national data, estimated that 57 per cent of children aged two to 19 in the U.S. in 2016 will be obese by the time they are 35 years old. To put that in perspective, the current rate of obesity among 35-year-olds in the U.S. is 35 to 40 per cent, lead study author Zachary Ward told Reuters in a telephone interview. "It seems the excess weight gained in childhood puts kids on a trajectory that persists," he said, recommending that "children with obesity now could benefit from early intervention," such as a better diet with fewer sugar-laden snacks and improved physical education programs in schools. Ward is a researcher at the Center for Health Decision Science at the Harvard T.H. Chan School of Public Health in Boston. 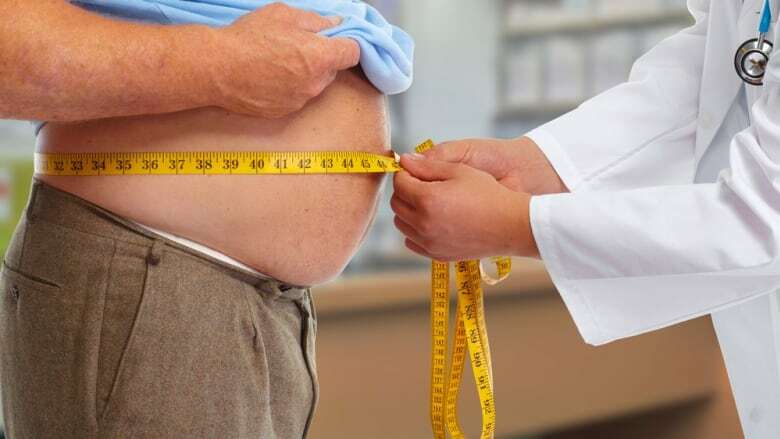 Statistics Canada data from 2014 — based on people's self-reported heights and weights — suggest Canadians between age 35 and 44 had obesity rates of approximately 20 to 25 per cent. The study's U.S. estimate comes at a time when obesity rates in that country have stabilized among children aged six to 11 and even declined for children aged two to five. But rates have continued to rise among older Americans. About six per cent of U.S. children, 4.6 million, already have severe obesity, which means a body-mass index (BMI) of 35 or higher. "Severely obese children are at especially high risk for adult obesity," the study team wrote. Their chances of not being obese at age 35 are just 21 per cent for two-year-olds, dropping to about six percent for 19-year-olds, they said. The new analysis was an attempt to predict how a child's current weight might influence his or her obesity risk in adulthood. It used height and weight data from a nationally representative sample of 41,567 children and adults. "In some ways, this is a surprising finding just because of the sheer magnitude of the problem," Ward said. "In other ways, it's not surprising when you look at how trends in weight gain and obesity have been going over the past 40 years. In some parts of the country, we're already approaching that level of obesity." The researchers projected that among obese children, the likelihood that they would continue to be obese by age 35 increased with age. Obese two-year-olds had a 75 per cent chance. Obese 19-year-olds had an 88 per cent chance. Conversely, children who were not obese had a lower risk of being obese at 35, and those odds continued to decline with age — from 58 per cent for children at age two to 44 percent for 19-year-olds. "Only those children with a current healthy weight have less than a 50 per cent chance of becoming obese by the age of 35 years," the researchers said. The study did not examine solutions. But the authors cited a 2015 study in the journal Health Affairs that concluded the three most cost-effective strategies for addressing childhood obesity would be a penny-per-ounce tax on sugar-sweetened beverages, setting nutritional standards for all food sold in schools (outside school meals) and the elimination of the tax subsidy that food companies tap when they advertise unhealthy food to children.